Let's get the most important fact out of the way first. The GTX 1070, it's better and more expensive than the GTX 1060 but it's not as powerful and it's cheaper than the GTX 1080. That feels better doesn't it, getting the obvious out of the way before we look into it further. Now to more serious matters, lets get a real brief, beginners introduction to the NVIDIA GeForce GTX 1070 Series Graphics Cards here. Shortly after the GTX 1080 Series was launched in May 2016, NVIDIA released their GTX 1070 range to the World in early June. Offering the user a slightly less powerful GPU compared to the 1080 however the price point is much more appealing to the every day gamer who wants to upgrade to that extra powerful punch. The GTX 1070 Series comes in two variations of the cards, the Founders Edition and then their standard cards. The Founders Edition Cards were the first to hit the market when the 1070's were originally released and at the moment they tend to be the lower costing cards to the customer because they are a trimmed down, slightly more basic version of the actual physical card, they have previously been referred to as the Reference Cards. The more advanced cards in the series, are when the Manufacturers such as Gigabyte. Asus and MSI take the build of these Founders Edition cards and they add their unique styles to them, for example as you can see her, two similar Gigabyte GTX 1070 Cards below. When you compare the main specs to their closest non Founders Edition cards, there isn't a huge amount of difference, just slight increases accross the board. Both of these cards come with 8GB GDDR5 Memory as is the standard accross the board for the 1070 cards and also the Cude Cores are the same at 1920. However when you start looking at the specs in more details you can start to see the extra increases the Non Founders Edition card gives you. The Core speed goes from 1506MHz to 1582Mhz, the boost from 1683MHz to 1771MHz and these are the works of where manufacturers like Gigabyte tend to put their own Overclocking features into the card to give these extra speeds to the customer who wans to eeke out as much performance and speed from these cards as possible. The WINDFORCE 2X cooling system features two 90mm fans, 2 pure copper composite heat-pipes, unique blade fan design, heat pipes direct touch technology together delivering an effective heat dissipation capacity for higher performance at lower temperatures. The airflow is spilt by the triangle fan edge, and guided smoothly through the 3D stripe curve on the fan surface, effectively enhancing the air flow by 23% over traditional fans. The 3D Active Fan provides semi-passive cooling, the fans will remain off when the GPU is under a set loading or temperature for low power gaming. It allows gamers to enjoy gameplay in complete silence when the system is running light or idle. The composite heat-pipes combines both thermal conductivity and phase transition for efficiently managing the transfer of heat between two solid interfaces which increases 29% of cooling capacity. When you compare the 1070 and 970, what jumps straight out at you should be the Frame Buffer doubling in size, from 4GB DDR5 to 8GB DDR5, that is double the amount of VRAM available. If you do a quick Google search you'll be able to find forums and blogs discussing how much VRAM you need for Gaming, is it 4GB or 6GB or 8GB and so on. You can make the same case for it for all features, how much you need will depend on what game and at what settings you are playing it at, however doubling the amount in this case for this series is a very impressive leap. If you're into specific games and you want to see how they run using a GTX 1070, there's a very strong chance that there is currently some gameplay comparison footage sitting on You Tube somewhere already, I've managed to find some instantly comparing the 970, 1070 and the 1080 with For Honor. This includes the visual gameplay footage for your eyes to feast on, I find realistically it can take a keen eye to notice the slight differences at times but when you see elements such as the visual fire or water you can really see the differences in how much crisper the better Graphics Cards are. It also gives you the comparison figures, such as the differences between the FPS (frames per second) which you can see here are a great deal higher from the 1070 than the 970 but that's all the extra power you're getting so expected. The other main stand out for me personally when watching that video, check out the differences between the temperatures they are running at. The GTX 1070 is consistently running just below 60 deg celsisus where as the 970 is almost hitting 80 most of the time, this is a huge amount of difference, almost a 25% variation between them. Now we've previously discussed the GTX 1060 series in a bit of detail here especially regarding the difference between their 3GB and 6GB versions - so we'll need to keep that in mind when comparing them, but the most noteworthy comparison will be the 1060 6GB Version to the 1070 as they're the closest in features and specification. Comparing the 1070 to the 1060 is a bit more fairer than to the 970, this video from SkuezTech here doesn't use the Graphics for you to look at but it shows you the FPS of a 1070 vs 1060 at different resolution settings for 1080p (1920 x 1080) and 4K (3840 v 2160) for games such as Fallout 4, Witcher 3, Grand Theft Auto 5 and more. The gaps between them aren't as vast to the 970 but giving the difference in the FPS is still hits double digits when playing these games on Ultra settings, Fallout 4 which visually is a cracking game gets 114.7 and 58.7 FPS for 1080p and 4K compared to 102.8 and 41.5 for the GTX 1060. If you watch that video to the end, one of the pros for the GTX 1060 is that it's cheaper, this is correct but the 1050 Ti and 1050 is also cheaper so it's a very tough argument to make a case for. I find it's also worth nothing that the test system used in that video is using an i7 Processor where a lot of gamers prefer using an i5 for certain reasons. Just like all the other GPU Series, the prices vary greatly from cheapest to most expensive depending on lots of different factors. To give you an idea of the price difference between the cheapest compared to other families, as of writing, our cheapest GTX 1060 is £185.99, GTX 1080 is £459.89 and our cheapest 1070 is £389.99. As you can see the 1070 and 1080 are much closer in prices and that's really inline with the gap between their specs and performance and we'll look into the GTX 1070 vs 1080 and 1070 vs 1060 now. 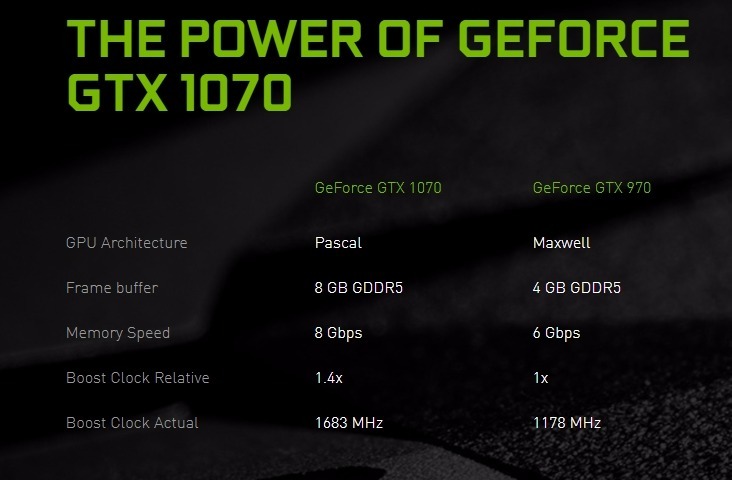 When the GTX 1070 cards were released, the Founders Edition Cards were actually slightly higher in price than the non Founders Edition cards due to stock availability and demand however their transition to being cheaper was swift after the non Founders Edition cards were released and stock was freely available. 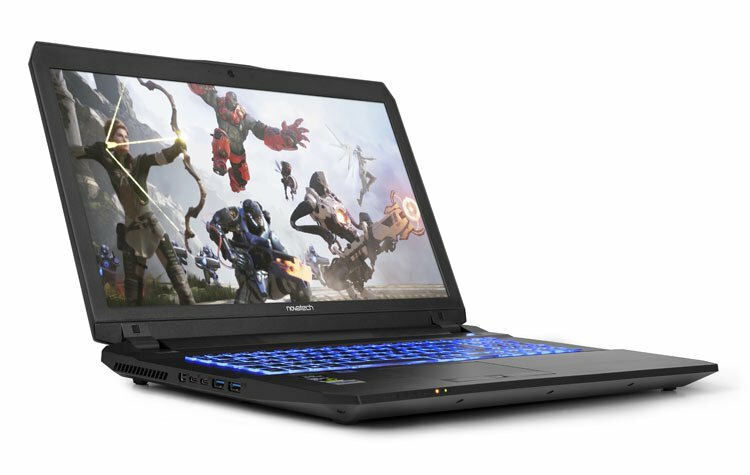 The GTX 1070 is a very popular choice for Gaming Laptops. You can get all of the good main features of the GTX 1070 Series in a Laptop which you can use on the move. They're still powered by the Pascal architecture with the VR Ready features but also they have their own unique technologies such as the NVIDIA Battery Boost whicl allows you to game on the go and deliver performance and extended battery life to stop you from hitting 0% mid-game.